An alternative or addition to grass. 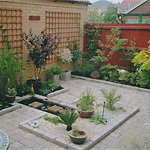 A patio or path can enhance any area, a sun spot or a shady calming retreat. An ideal place to socialise with family and friends. 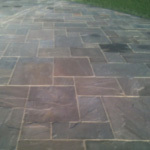 All of our patios are constructed to the highest of standards. 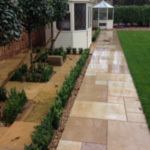 We take extreme care and pride with all stages, beginning with the careful excavation of the required area ensuring minimal disruption to the surrounding area. Once the excavation has been completed we lay a Terram membrane to stabilise & prevent weed growth. A consolidated sub-base of Type One crushed concrete or granite then covers the membrane. 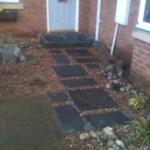 While laying the paving, manufacturer's guidelines are adhered to and this will affect whether we use a mortar bed or a wet coarse sand & cement screed. 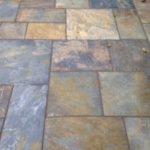 The paving joints can either be butted together and finished with kiln dried sand, 10mm joint & hand pointed by trowel or finished with a geo-fix depending on the style of paving and customer preference. After the winter months, remove any build-up of algae by using a dilution of Jeyes Fluid. 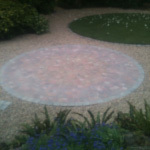 We are very pleased withe patio and thank you very much - it was worth waiting for.